With it being equivalent to less than £1 at the current exchange rate, I didn’t really have much expectation on how this would perform but I was quite pleasantly surprised. To use this, I had poured some into a container, dipped my brush in, swirl it around on the palm of my hand and then rinse. This way wasn’t too bad but for better results, use it in conjunction with a brush cleansing mat, glove, palette, etc to get a deeper clean. Brushes are clean if the they’ve been used with powder products. I did find that if they’ve been soiled in liquid or cream products, it doesn’t clean as well. It’ll require a few more washes to get it all cleaned off. It didn’t work well with my beauty blender due the cleaner being a watery consistency. The brushes drinks up the cleanser due to it’s consistency so I end up refilling the container. There is a slight chemical smell which may be bothersome for some people. The best way to describe it is it reminds me of super glue, a faint, weak, super glue scent. It doesn’t linger onto the brushes once they’ve dried though. The chemicals does dry my hands a bit so if you have sensitive skin, it’ll be harsh. I 100% recommend you use this with a cleansing mat, glove etc. For the price, it’s pretty decent. It helps cut the cleaning time down by a lot. There is a downside though. You can’t purchase this easily as there are no stores in the UK or Europe. Wish I had just purchased more whilst in Taipei. Once this is empty, I’m going to go back to the trusty baby shampoo. That is surely a great price for brush cleaner, and it is great that is cuts down on the time that it takes to clean them. It's too bad you cannot buy it in Europe, is there a way to buy online from Taipei? Sounds good for a quid! We don't use make up brushes but sure this would be useful for others. No i will admit I have never used a brush cleaner, I just use soap and water and brush it all over my hand which generally does the trick. I think these can be useful for those with a number of brushes as it must make cleaning them faster. I'm in the market for a new brush cleaner, thanks for posting! I usually just use baby shampoo or the MAC spot cleaner if I'm in a hurry, but this doesn't sound too bad! Also, WE HAVE DAISOS IN THE UK?!!!! Where?! I swear I've never seen one in London! I hear their stationery is a-mazing too! Wow that is ridiculously cheap! Not sure about the smell though.. super glue sounds gross! No but I really should as my brushes need good clean! Its great that it is less than a pound as well. 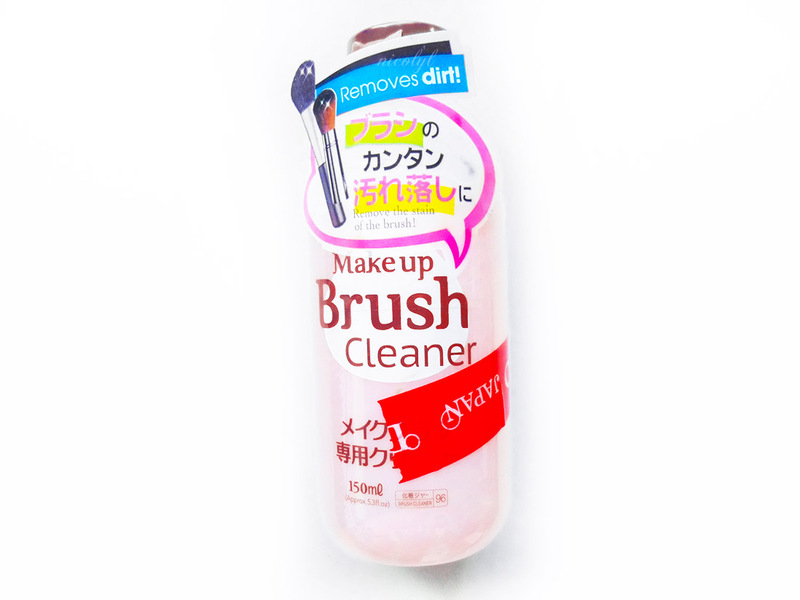 I am really not very good at cleaning my makeup brushes, so I need this for sure. Just soap and a brush egg for me! This is such a bargain and a great find! I like products that can be used for more than one purpose and while they superglue smell puts me off the idea of using this on makeup brushes it might be perfect for some of my art brushes. I do love it when a product you don't expect a lot from actually turns out to be pretty good! I love multi purpose products like this. Sounds amazing. WOW! what a total bargain! I have been using a beauty blender sponge cleaner for my brushes but I can use a cheaper alternative! I just said the other day that this coming weekend all my brushes are being cleaned! I need something like this!